As you probably already know, Chile is administratively divided into 16 Regions. The Region De Los Lagos or Decima Region (Tenth Region) as it is also known, is located in the Center-South of the country, bordered on the North by the Region De Los Rios, on the South by the Region De Aysen, on the East by the Argentine Republic and the Pacific Ocean on the West. 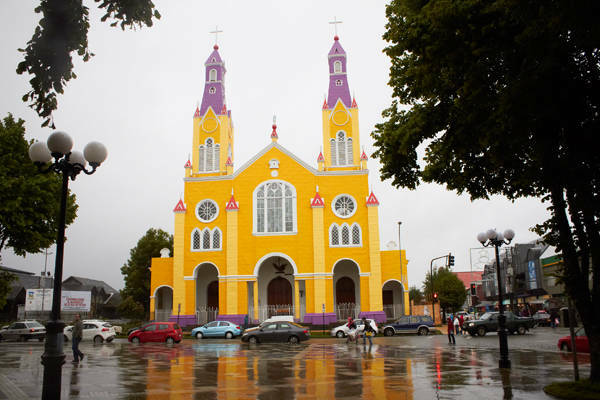 Its capital is the city of Puerto Montt and the provinces that make up the region are 4, from N to S: Osorno, Llanquihue, Chiloe and Palena. According to the 2015 census, the regional population was 841123 inhabitants. The economy is based mainly on agriculture, forestry, livestock, fishing, salmon farming and dairy industry, services and tourism, supported on a wide range of natural scenery throughout its extension, typical food, folk music and traditions, especially in the province of Chiloe. The German colonization, mainly between 1850 and 1910, has left an important legacy in all areas of the regional life. The "Isla Grande de Chiloe" (Greater Island of Chiloe) and all the adjacent islands are one of the emblematic places to sightsee in Chile, they are like a separate chapter within the Region De Los Lagos. What makes the place so special are its own culture and traditions, its festive music, according to the personality of its people, the cuisine, with unique characteristics and the gentle, beautiful landscapes. Among the most important places can be mentioned Chiloe National Park, located in the Western part of the island, with its 431 km.2 it currently represents one of the most visited protected areas in Chile. In the commune of Quellon, South end of the main island, lies Tantauco Park, a private reserve open to the general public. Tantauco is considered one of the 25 World's richest territories in Biodiversity, therefore a top priority for the conservation of Nature. Parque Tantauco is one of the most important places for trekking in Chile, the trails total almost 150 km, with routes of low and high difficulty in the southernmost and wildest part of the Greater Island of Chiloe. Important tourist places are also the towns of Ancud, gateway to Chiloe, founded by the Spaniards in 1768; Castro, the current provincial capital, with a very typical architecture in addition to the Iglesia de San Francisco (San Francisco Church) declared a World Heritage Site; Dalcahue, small town located 25 km North of Castro; Chonchi, known as "La Ciudad de los Tres Pisos (The City of the Three Floors), because it is built on three natural levels. On the other hand, the old Churches of Chiloe, the 16 that have been declared World Heritage by UNESCO and the rest, all belonging to the "Escuela Chilota de Arquitectura en Madera" (Chiloe's School of Religious Architecture in Wood), have unique characteristics that have earned recognition all over the world. The small bay of Angelmo lies 3 km from Puerto Montt downtown. Currently, Angelmo is the most important tourist attraction in the city since here are concentrated the Maritime Terminal that connects with the province of Chiloe and the Regions of Aysen and Magallanes, there is also the Craft Fair, a Fishing Terminal to sell the products brought by the locals and a large Seafood Market where these products are sold in small restaurants. Created in August 1926, this protected area is the oldest in the country. Within its more than 253,000 hectares of surface, there are great tourist attractions, framed by the Andes Mountains, an evergreen vegetation and turquoise water lakes, places worthy of a postcard. Particularly worth mentioning are the Osorno Volcano, true icon of the Region De Los Lagos, considered "almost perfect" because of its shape and colors; the wonderful Lago Todos los Santos (Todos los Santos Lake), one of the most photogenic places in Chile; Los Saltos del Petrohue, set of small cascades of the Petrohue River which fall among rocks of volcanic origin, another of the favorite views of the photographers; Laguna Verde, gateway to Vicente Perez Rosales National Park, so called because of the color given to the water by two micro-algae that live in suspension; Monte Tronador, inactive volcano of 3491 mts. of altitude, in the border between Chile and Argentina. The Museo Colonial Aleman, inaugurated in 1984, is located in the town of Frutillar, mainly dedicated to preserve the legacy of the German immigration in the area of Llanquihue Lake. It is made up of a group of five buildings covered with wooden tiles, in the style of Southern Chile. At the entrance is located La Llaveria, where currently are carried out administrative activities of the museum, then you can visit La Casa del Molino (The Mill's House) with a large sample of objects, documents and explanatory panels of the different historical stages shown in the exhibition, outside the house there is El Molino de Agua (The Water Mill), one of the first machines used by the settlers on the shores of Lake Llanquihue, around 1870. Other facilities are La Casa del Herrero (The Blacksmith's House), with machines, carriages and tools of the time; El Campanario (The Bell Tower), a circular barn where the sheaves of wheat were gathered and finally on the hill you get to La Casa Patronal (Main House) built in 1889, where you can see how the houses of the German settlers were thanks to the economic development they got. Near the Casa Patronal there is a Family Cemetery, as was customary at the time among some immigrant groups. Lago Llanquihue, 22 km away from Puerto Montt, is the second largest lake in Chile, its name comes from the "Mapudungun", autochthonous language meaning "sunken place". 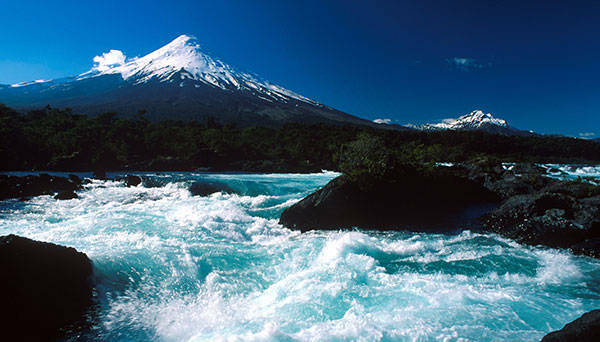 It is a tourist destination recognized worldwide, on its banks are towns and cities of great scenic beauty, having as backdrop the volcanoes Osorno, Puntiagudo, Calbuco and Tronador. Highlight the city of Puerto Varas, with its Sagrado Corazon de Jesus Church, beautiful and imposing Temple which can be seen from any point of Puerto Varas; the Waterfront of the town of Frutillar Bajo, a must see, here is also the Teatro del Lago (Theatre of the Lake), artistic center amidst a beautiful setting where every year a festival of Art Music called "Semanas Musicales de Frutillar" takes place; Ensenada, main tourist center on the eastern shore of Lago Llanquihue, a place of a beauty difficult to find in other parts of the World, in addition to its good infrastructure to serve tourists. Lakes Llanquihue, Todos los Santos and surrounding places are suitable for various adventure tourism activities such as sailing, windsurfing, rafting, kayaking, water skiing, recreational fishing, mountaineering, skiing, etc. Following the Carretera Austral, 46 Km. SE of Puerto Mont lies this protected area whose name translated into English would be "Andean Larch National Park", because of the 20,000 hectares of this tree which once covered hundreds of thousands of hectares in this part of Southern Chile. Today there are only 42,000 hectares, protected by the Chilean State. It should be noted that the Larch Tree is one of the oldest on the planet, can live from 3000 to 4000 years, grows only 1 centimeter every 15 years, despite this it can reach 50 meters high and 3 to 4 meters in diameter. In 1982 was created this Natural Reserve, precisely to protect these true relics of Nature, although the Park also includes other native species such as the Coigue de Magallanes, Coigue de Chiloe, Lenga, Tenio, Mañio and Canelo. Alerce Andino is open all year round although the most suitable time to go is Spring-Summer season, there are trails for trekking, the whole area is very rainy so you should take the appropriate precautions. Undoubtedly, the Carretera Austral, also known as Ruta 7, is one of the most panoramic roads in the World. The geography of this part of Chile is very difficult but many of the landscapes are worthy of a postcard. 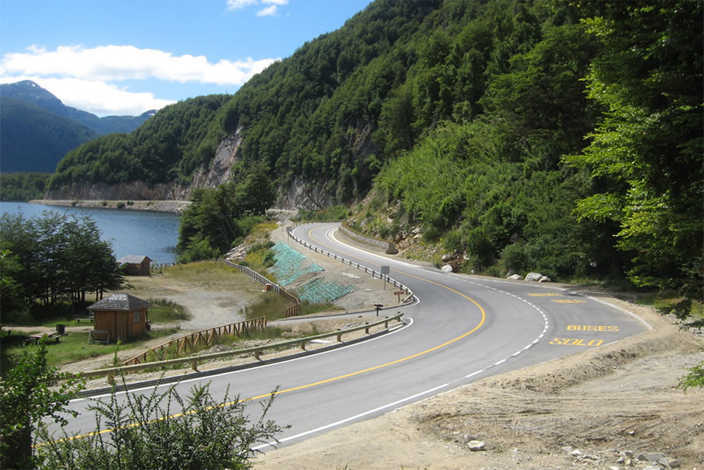 It is a road in constant expansion, there are currently almost 1300 km between Puerto Montt and Villa O'Higgins, with paved parts (the least), other gravel and certain sections that must be made in ferries. The next paragraph also includes places of the XIth Aysen Region. Among the outstanding sites can be mentioned Hornopiren, the North Gate of the Carretera Austral; Parque Pumalin, one of the largest and most important Private Nature Reserves of Chile and South America, of great scenic beauty; La Junta, North access to the Aysen Region; Parque Nacional Queulat, one of the most visited by tourists who travel along Route 7; Laguna San Rafael National Park, the largest in the Aysen Region, with incredible landscapes of millenary ice from the Northern Ice Fields; La Catedral de Marmol (The Marble Cathedral), mineral formation of calcium carbonate in the middle of the blue waters of General Carrera Lake, a series of wonderful caverns through which tourists can navigate in small boats. The basin of Futaleufu River is a very important tourist area in the Los Lagos region, recognized worldwide by fly fishing lovers, also thanks to its fast Class V rapids for the practice of rafting, horseback riding and mountain biking. Despite being a remote mountain area, almost lost on the map and very close to the border with Argentina, the place has good infrastructure to receive visitors, with a varied culinary offer and accommodation. Another place nearby, emblematic and true paradise for lovers of recreational fishing is Lake Espolon, also full of charming places. From Futaleufu you can reach Argentine territory through the Trevelin International Pass.